In today's workforce, people tend to change jobs several times throughout their working lives; the gig economy can be seen as an evolution of that trend. Notably, in this digital age, the workforce is increasingly mobile; we can now work from anywhere, as we explained in our previous blog 'The rise of the digital office'. That means that freelancers and contractors can select jobs and projects around the world, while employers can select the best individuals for specific projects from a larger pool than that available in any given area. The term has entered into the vernacular with definitions found on many dictionary sites. Linguists agree, the word ‘gig’ originates from the music world; a gig is a paid appearance of limited time. Not only has the trend impact our vernacular but it has changed the way businesses react to the behaviours and desires of the workforce. It will be a trend to watch in terms of legislation and protection for workers; we have already seen changes to the law regarding 'zero hours' contracts for example. Companies like Uber have encountered their own HR issues when it comes to a business model built on the self-employed. For some, it’s not all rock and roll – For others its rock stardom! 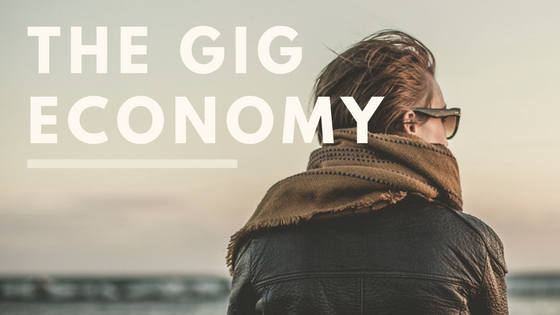 Today, more and more of us choose to make our living working gigs rather than full time. To the optimists, it promises a future of empowered entrepreneurs and boundless innovation. To the critics, it a far from utopian world of disenfranchised workers hunting for their next wedge of piecework. From the perspective of the freelancer, a gig economy can improve work-life balance over what is possible in most jobs. Other influences include financial pressures on businesses leading to further staff reductions and the entrance of the Millennial generation into the workforce. In the past five years, the gig economy has become a major trend impacting the global workforce, and has created a new kind of diversity, with full-time permanent employees working alongside freelancers. A study exploring the gig economy found that 93% of companies already identify the blended workforce as they’re seeing freelance workers teaming up with employees to work on projects together. Multiple studies from The Freelancer’s Union to Intuit predict that at least 40 per cent of the workforce will be freelancers in the next few years.